upon their completion of the mandatory five years of Torah study. are returning to Judaism and making aliyah. Michael Freund traveled to the tropical forests of Peru to find out why. It is a sweltering summer day in the city of Iquitos, as the sun beats down mercilessly at the gateway to the Amazon river in northeastern Peru. Despite the heat, the town center bristles with life, as merchants and shopkeepers hawk their wares in the marketplace overlooking the water, offering a variety of goods for sale, ranging from freshly laid turtle eggs to colorful and exotic fruits. Boat captains of dubious maritime proficiency accost a group of foreigners, promising them an afternoon of adventure in the dense and forbidding Amazonian jungles, where bright toucans, 20-feet long Anaconda snakes and energetic spider monkeys roam about at will. But nature is not all that is vibrant in this remote corner of the country. Quietly, and without much fanfare, a remarkable revival of Jewish life has taken place here too. Against all odds, hundreds of descendants of 19th-century Moroccan Jewish settlers in the area are now seeking to reclaim their heritage and move to Israel. "Every Jewish community is unique, but the history of Iquitos' Jewish descendants is so exceptional that it almost sounds fictional," says Dr. Ariel Segal, a Venezuelan-born Israeli scholar now teaching at a university in the Peruvian capital of Lima. "Theirs is a survival of the soul." It was in the 1880's, notes Segal in his book, Jews of the Amazon, which is considered the definitive account of the Iquitos community, that the local rubber boom triggered an economic and social transformation of the area. Thousands of immigrants from across the Atlantic, including many young Moroccan Jews, made their way to South America in search of fame and fortune, pulled by the prospect of dazzling financial rewards as well as the opportunity to escape harsh conditions back home. continued down the Amazon to Iquitos." Initially, the Moroccans had no intention of staying for long. Indeed, while they built a cemetery to accommodate the inevitable loss of life in a frontier area, they refrained from constructing a synagogue, as they saw no need for a permanent structure, sufficing to conduct regular services in people's homes. With the passage of time, however, many ended up marrying local Indians. Others, following the custom then prevalent in the area, fathered offspring with several women while trading along the Amazon, where they would often spend weeks or months at a time winding their way through the jungle on commerical expeditions. Though many of the Moroccans eventually pulled up stakes and left, a number of them stayed behind and founded a Jewish community in Iquitos, which was formally registered with the government in 1909. In recent years, their children, grandchildren and even great-grandchildren, have begun to reclaim their Jewish heritage. Many bear distinctly Jewish names such as Cohen, Ben-Zaken or Ben-Shimol, while thier outward appearance is often nearly indistinguishable from the surrounding population. instructing them never to forget their origins. The current president of the Communidad Juda de Iquitos, Ronald Levy, is a case in point. His grandfather was born in Tangiers, Morocco, and came at the height of the rubber boom, settling down in a small town along the nearby Ucayali river, where Levy's mother was born. Speaking in near-fluent Hebrew, Levy, an inspector for Peru's national oil company, describes the reawakening of his community and the challenges they face with a mixture of both precision and care. to better prepare people for life in Israel. "About 200 members of the community have made aliyah in the past several years," Levy says, "and more will be going to Israel in September and October." There are an additional 100 descendants of Jews in Iquitos who have also begun the process of return, he notes. All those leaving for Israel, he says, undergo a Conservative conversion by Rabbi Guillermo Bronshtein of Lima, and then make aliyah under the auspices of the Jewish Agency. Once in Israel, most of them go through an Orthodox conversion as well, an option unavailable to them in Peru. referring to their desire to rejoin the Jewish people. For Calev Perez, conversion to Judaism and emigration to Israel represent the closing of a historical circle. Perez' grandfather was a merchant who found his way to Iquitos via Spain and Portugal, but never left. "My grandfather's death certificate says he was a Jew," the 28-year old Perez proudly notes. Although his late father had "some Jewish leanings", he eventually became an evangelical Christian. But Perez, his mother and two brothers were all drawn to Judaism, and they recently underwent conversion by Rabbi Bronshtein. "We do what we can to keep kosher. We do not eat pig or turtle," he said, referring to two of the more popular local delicacies. "We study Torah and try to be good people, and we observe all the holidays." After Perez and his family make aliyah this month, he plans to go through an Orthodox conversion, "so I can get married and have children." Although as early as the 1960's, several Iquitos Jews succeeded in making aliyah, the turning point for many of the Jewish descendants came over two decades later, when several of them resolved to revitalize community life in the city. "they succeeded in forging a community." Ronal Levy recalls. "We were skeptical at first," he says, "but there was a precedent for it. In 1989, three rabbis flew in and converted several members of the community, who then made aliyah. So we know it was a real possibility." and the Jews of Iquitos began heading for Israel. Raquel Prutsky-Kilimajer, the Jewish Agency representative in Peru, has nothing but praise for the Iquitos community. "They feel very strongly about Judaism, and they want to live in the land of their ancestors," she says. "They know that for them and for their children it will be a better future." who have moved in recent years, she said. from the rest of the outside world. But beyond that, she says that as the community has grown in strength and commitment, they have come to realize that their best bet for long-term survival as Jews lies elsewhere. "There is no Jewish future and no economic future here". Historian Segal agrees, saying "most of those remaining will go to Israel, and I think that is the best type of 'assimilation' that can happen." surrendered to the fate of being in an isolated place." Over a century ago, after sailing across the ocean, Moroccan Jewish immigrants heading to South America would typically start out at the Brazilian coastal city of Belem, where many of them eventually stayed. 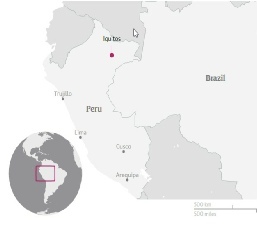 Others continued further west, following the Amazon to the Brazilian city of Manaus, while a smaller number ventured on to Iquitos in Peru. But there is plenty of evidence to indicate that all along the length of the Amazon (which at 4,000 miles is the second longest river in the world, after the Nile), the Moroccan Jewish traders made their presence felt. Various accounts exist ofJews, or their descendants, residing in remote parts of the jungle outside Iquitos. and then he told you who his father was." Though his research focused on Iquitos, historian Ariel Segal says it is known that there were Jews living in other places throughout the area. "There were Jews, and their descendants are still there, in other Amazonian cities and towns such as Pucallpa, Tarapoto, Nauta and San Martin, but I do not know if we are speaking nowadays about a few families or a more significant number." He says that while scholars have studied the Jewish communities of Manaus and Belem, which exist until today, no one has yet undertaken a comprehensive look at the countless villages and smaller habitations scattered throughout the jungle, where Jewish descendants may still reside. living in small villages throughout the jungle. that they undergo formal conversion." As head of the community, Levy is anxious to reach out to the remaining Jews of the jungle, whether in Iquitos or beyond, and help those wishing to return to Judaism to do so. "We want to bring them back," he says. "They are interested in Judaism. They have the spark." “The community may die,” said Jorge Abramovitz, the owner of the shop that houses the city’s only synagogue. “Because the majority left Iquitos. to arrive in Israel by the end of 2014.
in which a total of 150 are expected to arrive by 2014.
and whose immigration has been approved by the Interior Ministry. and that is why most of the new immigrants are moving there." and who married and had children with local women. Under current immigration procedures, individuals who are not born Jewish are expected to spend nine months as active members of their local Jewish communities after they have completed the conversion process – regardless of what type of conversion they have undergone – before they move to Israel. During this time, their applications are reviewed by the Interior Ministry. The ministry, which does not have its own emissaries abroad, typically relies on recommendations from the Jewish Agency about the validity of conversions performed abroad. The Jewish Agency last year notified the Interior Ministry that it had determined the conversions performed for the group of 284 Peruvians fulfilled all the necessary criteria to make them eligible for immigrating to Israel under the Law of Return. But ministry officials initially insisted, despite a Jewish Agency legal ruling to the contrary, that bringing this large a group of converts to Israel required a special cabinet. by the Interior Ministry’s refusal to grant the Peruvians permission to immigrate.